by Brianna Crandall — September 26, 2018 — Innovative LED lighting solutions provider Lighting Science just announced the launch of what it calls a “revolutionary” new light-emitting diode (LED) luminaire engineered to reduce airborne pathogens responsible for numerous illnesses. Cleanse is an easy-to-install, air-sanitizing LED retrofit luminaire designed to decrease the levels of airborne particles, including microorganisms. Lighting Science points out that the spread of illness is a health concern that is widely felt in health care, schools, gymnasiums and a multitude of public spaces, and a top concern for facilities managers (FMs). Cleanse is designed to help prevent exposure to dangerous pathogens using an efficient, multi-stage, air circulation and sanitation system. Activated carbon and HEPA filters capture particulates, while ultraviolet (UV) LEDs (A+C) further clean and deodorize the air. This process reportedly achieves a >99.9% elimination rate among the most common airborne pathogens resulting in reduced contamination, less illness and a lower risk of infection, particularly valuable for immuno-compromised individuals. Cleanse’s retrofit design enables most standard 2’x 4’ light fixtures to be replaced in as little as 15 minutes, minimizing interruptions to normal operations and decreasing installation costs. 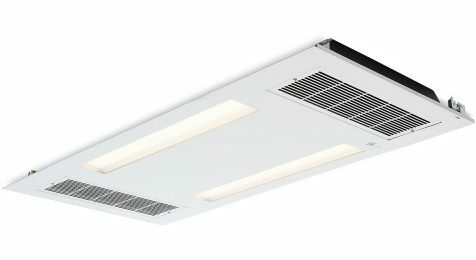 The LED retrofit luminaire provides 3200 lumens of high-quality light, while only using 60 watts of energy when both illumination and air-cleaning mode are operating. In addition, it is available in a wide range of color spectrums to match existing environments, including Lighting Science’s alertness-enhancing GoodDay. The Hospital-Acquired Condition (HAC) Reduction Program, mandated by the Affordable Care Act, requires the Centers for Medicare and Medicaid Services (CMS) to reduce payments to hospitals with the highest incidents of HACs. Cleanse represents a viable solution to major hospitals that are being penalized tens of millions of dollars a year. For many medical institutions, the cost of outfitting their facility with Cleanse luminaires would be less than the amount of their annual HAC penalties, notes Lighting Science. A transformative technology such as the Cleanse system can effectively disrupt the inhalation exposure pathway of potentially life-threatening infectious diseases. In a hospital environment, this technology has the capacity to save lives, enhance patient health, reduce time to recovery, and lower health-care costs. The Sonder Academy in Melbourne, Florida, which has used Lighting Science’s GoodDay spectrum lighting since opening, has embraced the Cleanse technology for its students. Known for seeking mindful innovative solutions for children and families impacted by autism spectrum disorder, The Sonder Academy’s collaboration with LED innovator Lighting Science was natural. We are particularly sensitive to our students’ needs, given the nature of their disorders and their susceptibility to illness. We are always eager to embrace new technologies that can increase the health and wellness benefits for both our students and our staff. We have installed Cleanse in one of our three schools and have observed a decrease in the number of sickness-related absences for both students and teachers at this location compared to the other two. This technology has been a blessing. The Cleanse Air-Sanitizing LED Retrofit Troffer is available for purchase. Detailed product information and specification sheets can be found on the Lighting Science website.